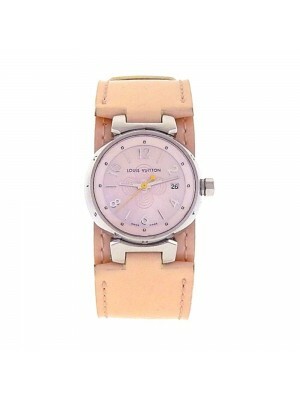 The famous luxury brand Louis Vuitton began its watchmaking activity in 2002 in an attempt to broaden its product range. The Louis Vuitton house belongs to the large LVMH Family that includes many world-famous brands of luxury products. One of the reasons why Louis Vuitton succeeded in watch manufacturing was that LVMH possesses huge resources, which opened the doors for the brand’s creative designers. The main idea driving the launch of the first watch collection was to create timepieces that could compete with the most celebrated Swiss companies. Louis Vuitton did not want to produce watches only to earn more money, it wanted to occupy a prominent place in Haute Horlogerie. It was interested in making not adorable little watches for style-conscious fashionista, but serious, complicated devices for the most demanding clientele. LVMH provided the company an opportunity to achieve this goal by engaging the best craftsmen, engineers, and designers in the sphere. Currently, Louis Vuitton owns a large manufacturing facility where many talented and creative professionals work on designing fine watches of the highest quality. This place raised the company’s in-house movement production capabilities and brought it to the top of the fine watch industry. The prices at which Louis Vuitton new and pre-owned watches are sold show how much acceptance and credibility the brand has managed to gain for such a short period. Louis Vuitton’s first product was the iconic Tambour watch that has been since presented in numerous variations for men and women. The name of the collection is translated from French as “drum,” and this interesting name was selected due to the drum-like shape of the model. Simple watches for everyday use, as well as more complicated and expensive timepieces with chronographs, minute repeaters, tourbillons, Spin Time, and GMT have been designed later to meet the requirements of the diverse clientele. Some of the watches are connected with the brand’s other legendary products. For example, the Escale timepiece was dedicated to one of the most famous Louis Vuitton’s products – a travel trunk. One of the most recent collections include Tambour Moon, which features some of the best timepieces created by the brand. Interestingly, there is no moon phase indicator on any of these watches, but the name possibly comes from the case’s unique crescent shape. The most innovative and technically advanced collection, however, is Louis Vuitton’s smartphone line. These creative timepieces with a distinctive identity are certainly a new step in the world of high-end watch production. This collection is 2.0 powered and features a large round case that sets high on the wrist and a convenient strap that can be released easily. Someone may question whether smartwatches will conquer the world of Haute Horlogerie, but one cannot deny the fact that Louis Vuitton does its best to stand out from the crowd. For those who value more classical design, Louis Vuitton used watches can become a real treasure. 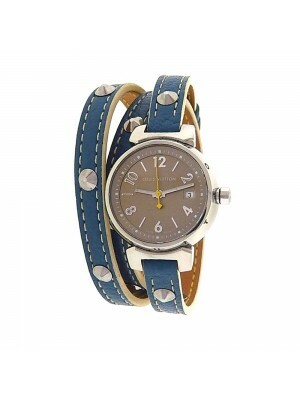 Produced during the past two decades, these watches have a cutting-edge look and a robust feature set. Louis Vuitton watches will fascinate both tech-lovers who seek technical excellence and stylish customers who want to follow the latest tendencies in watchmaking.